OLPC Learning Club: TimeLapse Activity Released! 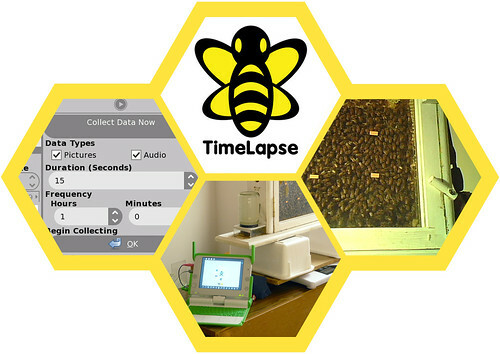 TimeLapse is computer software for the Sugar Learning Platform used to gather periodic data (sound and images). It is the first software activity developed by Sugar Labs DC and runs on the OLPC XO-1 laptop. The idea for TimeLapse grew out of the exciting, eclectic, interdisciplinary meeting of scientists, computer programmers, pedagogues, and hardware hobbyists originally brought together by the OLPC Learning Club DC. Dr. Frank Linton, who has an observation bee hive in his house, was interested in studying the relationship between the sound made by the hive and the health and well being of the bees inside. He wondered if he could use his XO laptop to gather periodic sound sampling from the hive. This real world need became the seed for the development of TimeLapse. Over the past two years, with Dr. Linton acting as customer, Jeff Elkner, and a group of young programmers from Sugar Labs, DC have made steady improvements to TimeLapse. The current release is the first one that is installable through the Browse Activity in Sugar, making TimeLapse easily available to Sugar users all over the world. Come celebrate the accomplishment of these talented young programmers. Bring your XO and try out TimeLapse for yourself. Walter Bender of Sugar Labs will join in by video conference from Cambridge, MA. We'll also raffle off an original copy of the new XtraOrdinary 2010 SD card! How delightful. It's looking very good... Let's see if we can incorporate this into the 10.1 activities list and the next major F11-on-1.5 release.